Are your kids ready to push their own thinking? Common Core is giving us time as teachers to dive deep into the math curriculum and really teach our students for mastery. Once they have arrived at the mastery level, its our job to increase their accuracy and speed all year long. These fluency drills are the perfect tool to make sure students are pushing their own thinking as well as increasing their speed. 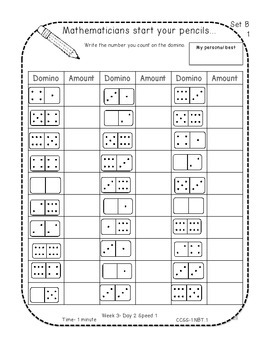 These drills are aligned to the first grade math Common Core standards. 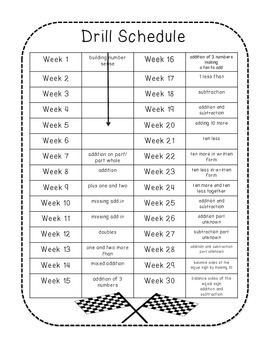 There are 30 weeks full of drills in this packet. Each week includes 2 days of drills. This fluency program is meant to be done twice a week in the classroom. Students will complete 2 drills each day back to back. They are racing to try and beat their first time. 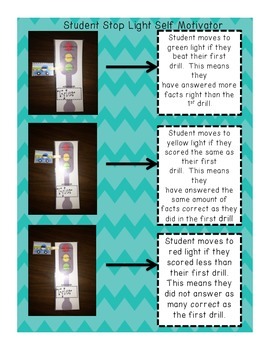 These drills are great, because they promote success in each individual student. The students are so busy trying to beat their own time, that they don't even see what their other classmates have scored. Also included is a self tracking speed light. 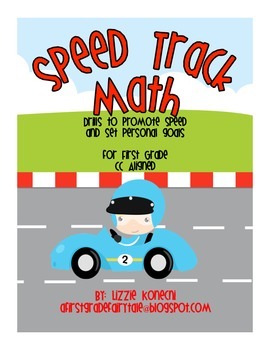 Students can indicate how they did from the first drill to the second drill by moving their racing car to red for faster thinking next time, yellow for scoring the exact same score, and green for zooming past.